When you combine burgers, fried foods, sodas and shakes with your normal diet, your calorie and nutrient totals may exceed normal limits. Meals that have 1,000 calories or more can easily make you gain weight, which increases your chances of developing clogged arteries, high-blood pressure, type 2 diabetes and some forms of cancer. How much fast food is too much? The U.S. Department of Agriculture reports that one or more fast-food meals per week are associated with obesity, a significant overweight condition defined by a body mass index of 30 or above. Meat- and fish-based entrees, as well as side orders such as fried onion rings and french fries, contain large amounts of cholesterol and/or saturated fat, substances that threaten your arterial health. The more you consume, the greater the buildup in your arteries. This narrows the space where blood flows, reducing the amount of oxygen that reaches your cells. Damage to the artery walls can create bleeding and dangerous blood clots. This condition, called atherosclerosis, or clogged arteries, can cause heart attacks and strokes. Hypertension, or high-blood pressure, is directly linked to excessive sodium intake. Many fast foods are loaded with the sodium that comes from salt used in seasoning. Burgers, tacos, french fries and even hot fruit pies have high sodium contents. Some, such as fried shrimp, have nearly 100 percent of the daily limit suggested by the American Heart Association. Hypertension increases the progression of atherosclerosis and raises your risk of developing heart disease. Although no one knows if fast foods themselves cause diabetes, health problems related to fast foods can increase your likelihood of getting the disease. Overweight, obesity, high-blood pressure and elevated blood-sugar levels have all been linked to type 2 diabetes. 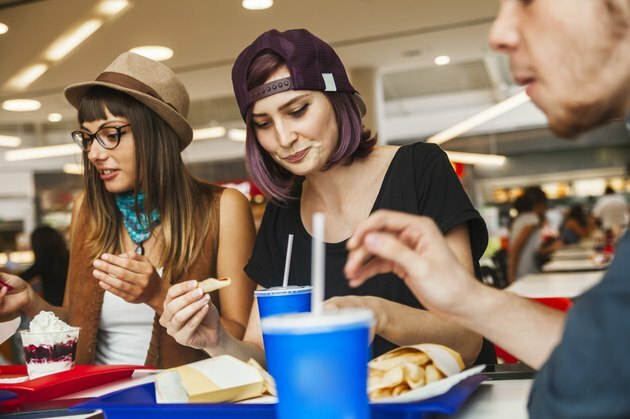 According to a 2005 medical study published in "The Lancet," eating fast-food meals more than twice per week can cause an average 10-pound weight increase in young adults over time. Carrying that much extra weight raises your risk of developing insulin resistance and type 2 diabetes. Again, fast foods themselves may not cause cancer, but they can cause conditions such as weight gain that precipitate cancer. Menus that emphasize fat and sugar at the expense of fiber and other beneficial nutrients have the poor-nutrition building blocks for cancer. The Office of the Surgeon General associates overweight and obesity with colon, kidney, gall bladder and other forms of cancer.